This is a fine plant, from six to eighteen inches tall, with purplish stems and handsome coarse foliage, all rough, hairy, and very sticky. The flowers are lilac, with purple stamens and pistil, and the general effect is that of a large coarse Heliotrope. The flowers have a pleasant scent, but the foliage has a strong and disagreeable smell, and it grows on the plateau in the Grand Canyon. Alpine P.alpina. Wild Heliotrope-Phacelia Crenulata. WATERLEAF FAMILY. 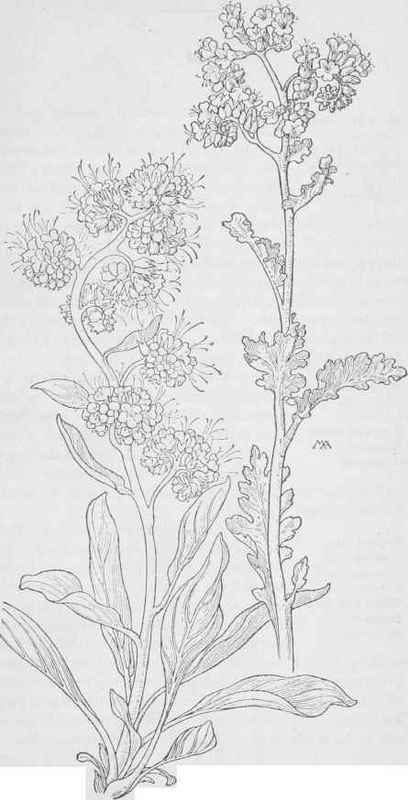 Hydrophyllaceae.